Either way you ride this pass it’s awesome and strongly recommended. It also has the advantage that it’s close to a number of other great passes – the Furka, Grimsel, Oberalp, Gotthard, and Susten – so base yourself in Andermatt and ride all these passes both ways. From Airolo the first ten miles or so is very fast and open but even when you get to the hairpins to take you the final climb to the summit, they are nice and open. The surface is also very good. Coming down towards Ulrichen it’s steeper but again the hairpins are nice and open and you can measure your turn in, apex, and exit lines before you get there. The pass then opens up down the valley before a final series of bends takes you into Ulrichen where you can turn right for the Grimsel and Furka passes. 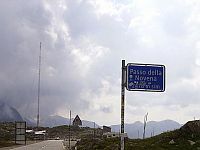 The ascent from Airolo is 14 miles at an average of 5.5%. From Ulrichen the ascent is 8.5 miles at an average of 8.5%. Fantastic either way.